Supporters of more money for K-12 education said Thursday there’s a reason they are taxing only the top 1 percent of Arizona wage earners to pick up the entire cost: It’s politically expedient. 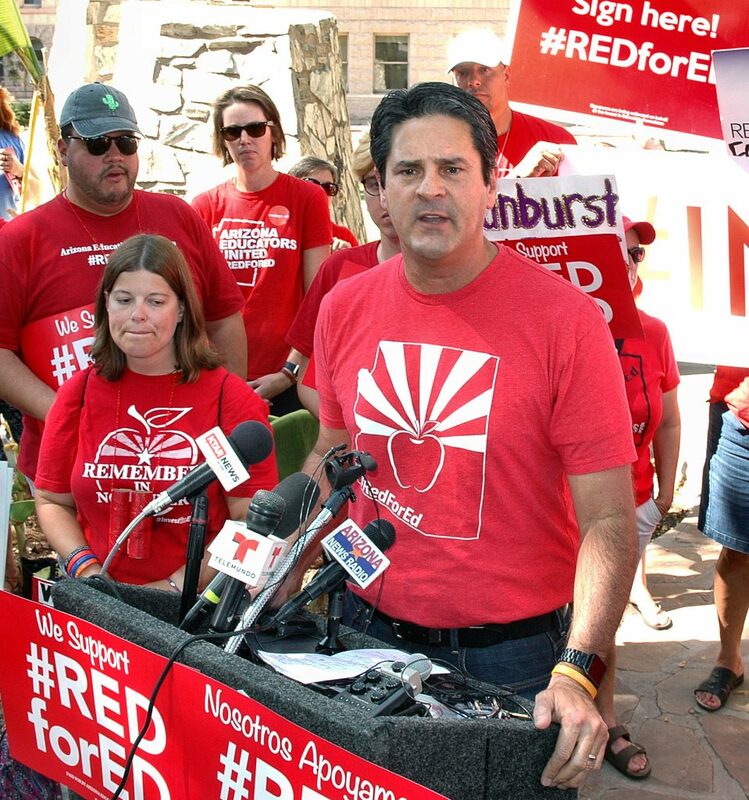 “We wanted to know what the voters were going to tell us,” Arizona Education Association President Joe Thomas said Thursday as organizers of the #InvestInEd movement submitted about 270,000 signatures to put a surcharge on state income taxes. “And the revenue stream that tested the highest was the revenue stream which we adopted, which was an income tax,” Thomas explained. Only individuals earning more than $250,000 and couples who file jointly with income of more than $500,000 will pay a surcharge of 8 percent on anything they earn over that amount. The current maximum state tax rate is 4.54 percent. And those in the $500,000-plus range or couples with $1 million income will pay 9 percent of what they earn above those numbers. Figures from the state Department of Revenue estimate that the bulk of the estimated $690 million that would be raised would come from about 20,000 taxpayers out of nearly 2.8 million who file tax returns. Thomas bristled at questions of whether such a system to fund education on the backs of a small minority of Arizonans is fair. “How is it fair that students are in overcrowded, underfunded classrooms right now?” he responded. And that, he said, is what led to the proposal they hope to put on the ballot. Backers need at least 150,642 of the signatures to be found valid to qualify for the November ballot. There already has been opposition of a sort. And it has political overtones for Gov. Doug Ducey who is trying to get reelected, at least in part by touting what has been done for K-12 education. The Arizona Education Project already has spent more than $1 million on TV ads praising Gov. Doug Ducey for the money that was put into education this session, saying that progress is being made in improving teacher salaries. That effort has been funded by allies of the governor, including Pinnacle West Capital Corp. which is the parent of Arizona Public Service, the Arizona Chamber of Commerce and Industry and the Arizona Lodging and Tourism Association. Separately, the Republican Governors Association, pushing for another four-year term for Ducey, already has run its own series of commercials extolling the incumbent for his commitment to education. teacher pay at risk” because the income of those at the very top of the tax scale is highly volatile. the top tax bracket becomes 9 percent. “What the last legislative session proved is that teachers win when Arizona’s economy is healthy,” he said. Ducey, while not taking a formal position on the initiative, has said he does not favor anything that raises taxes. Thomas told a rally of teachers and supporters Thursday he expects the campaign to be attacked. The #InvestInEd campaign actually is a political marriage of sorts. It originally was pushed by the Arizona Center for Economic Progress as a method of coming up with a sustainable source of revenues for education. In launching the drive, David Lujan, director of that group, pointed out that lawmakers agreed two decades ago to assume responsibility for new school construction and repairs. But lawmakers reneged on that commitment when tax revenues dipped during the recession. In the interim, the #RedForEd movement took hold, forcing Ducey to agree to a 19 percent increase in teacher salaries by 2020 and a commitment to restore all the money he and his predecessor, Jan Brewer, took from an account that pays for things like books, computers, buses and some capital needs. Supporters of that movement, however, pointed out that Ducey’s promise is based on projections of an improving economy, with no new dedicated revenues to finance either the raises or the restoration of the special account. So #RedForEd members took to the streets to circulate the petitions for the income tax surcharge to ensure it would have enough signatures to qualify for the ballot. Joshua Buckley, a teacher at Red Mountain High School in Mesa, who chairs the #InvestInEd campaign, said the number of signatures collected proves that voters do not believe that elected officials will adequately invest in education.